50 years old and finally got this in vinyl. so happy! A groundbreaking album. Not only to the DC community but across the nation. Fugazi took the DIY ethic in everything that they did and was able to do what nobody else could. And that was have a group of guys who not only enjoyed being in a band with each other and playing the music that they loved, but kept corporate and big business out of the mix. They forever have my respect for that. who knew this would turn out to be the greatest band to ever walk the earth. once "waiting room" starts there is no turning back. 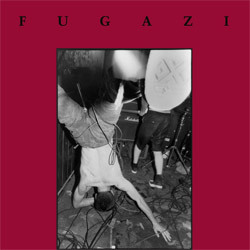 This is Fugazi's debut record, released in 1988. These 7 songs songs were later combined with the 6 tracks from the Margin Walker EP and released on the 13-Songs Maxi CD.